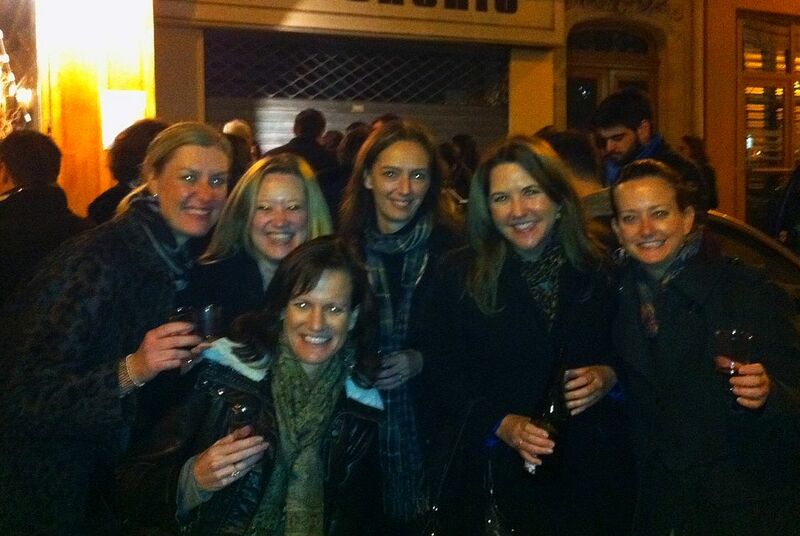 Page in Paris: The Holidays have arrived with wine, poultry and parties! The Holidays have arrived with wine, poultry and parties! The holiday season in Paris has officially kicked off for me with 3 biggies all happening in one week - the arrival of Beaujolais Nouveau, my birthday and Thanksgiving. I was eagerly awaiting the arrival of the Beaujolais Nouveau last Thursday to see how the French celebrate a wine holiday that I've only been able to partake in at arm's length. The third Thursday of every November is the release of this young wine made from the gamay grape. I heard many stories leading up to the day on how the wine is total "plonk," and it really isn't taken seriously or much acknowledged, but I still needed to find out for myself what was going on. I did a full write up on the day for Girl's Guide to Paris, and took some of my own advice that night. I starting by meeting some friends at my wine club shop, Spring. They were pouring 2 Beaujolais Nouveau, that were, surprisingly, not bad. In fact, it was quite enjoyable, but what may have kicked the easy drinking, light, fruity wine to the next level, was the festive atmosphere. There were definitely people out and ready for a taste of the new Beaujolais. Since the bottles were only going for about 10 euro each, it just made sense to get one, along with a cheese and saucisson plate. I also learned a new party trick and can now crack 2 walnuts open using only my bare hands. Hopefully I won't also always need a bottle of Beaujolais to perform this trick as well. Two steps outside of Spring is another popular wine bar called Garde de Robe and many Parisians were celebrating in the middle of the street with their Beaujolais Nouveau, so naturally, we had to join them. How can we drink wine in the street? Well, this is France, and this is their holiday, so there were hardly any cops telling us not to be merry on this festive occasion. More friends joined and a good time was had by all. In keeping with the autumnal season, my friend Doni asked if I'd like to join her at a unique restaurant that specializes in apples, Pomze. I love a good apple, so why not. They had a large selection of ciders so we asked the waitress to recommend 2 for us to try, and what she brought back was a taste of farm life. Unfortunately though, this part of the farm was centered more around the barnyard, where you don't want to step foot. My friend thought mine flat out smelled like poo, and I thought hers had more of a cat pee flavor. This was the first time I haven't been able to finish a drink since I've been here. Yuck. The wait staff at this place was a little odd as they could barely speak French or English. Japanese was their native language, but no one seemed to know what the specials were in any language. Every question had them scampering away to find the answer. We finally ordered after Doni had to grab someone out of the kitchen so we could get some food after sitting for quite a while. Luckily the chef knew what he was doing and we had fabulous, dense, slightly undercooked bread with delicious apple butter. Foie gras and pork ribs were next, each with an apple compote and hint of flavor within. My steak was buttery soft, and the meal was nicely finished with a rich, chocolate dessert. Apple was touched upon in each dish, but not overly so I don't need to go on apple hiatus for a while. Hopefully this restaurant will soon raise their service to match the food. I have another friend in Paris with a birthday right next to mine so we decided to have a joint party at a fun bar in St. Germain. Having only been in Paris a little over 2 months, it was hard to know if it would only be the 2 of us at our own party, but we had a great showing of wonderful people that we've both meet during our time here. People were great socializing with each other and making new friends themselves. They wouldn't make me a dirty martini, but I joined Doni in a martini straight up, and yes those are ice cubes you see in there. They kept bringing her about 1 sip of vodka with a whole lot of vermouth and she finally marched to the bar, told them to dump it out and just pour in vodka. "More vodka" was the rallying cry that soon became mine. Others were drinking champagne, and when they'd bring a bottle out, it had a sparkler in it, which was fun the first 2 times, and then I think they got self conscious with people being able to keep tabs on the number of sparkly bottles being consumed. None of this was any match for the Scottish contingent who were drinking and ordering wine bottles like it was contest to see how fast they could get the waitress to come back with another. Unfortunately I joined them at some point, and held strong right through the fantastic tap dancer that appeared like he was on a movie set with his dapper outfit. People started to trickle out, and some trickled in, and next thing I know it was 4am. The good news is that I have now realized that there are people in Paris drinking more than me, so that has to be the greatest gift of all. A fun birthday celebration. The day after was a bit of a slow day, but I had to rally for a pre-Thanksgiving dinner that night. I signed up for the event through the Meetup Social website that I've used before for fun events and to meet new people who are now friends. I'm going to a traditional US Thanksgiving dinner at a restaurant with some friends on Thursday, but I wanted to get a home cooked meal in as well, so off I went to chef "Shelley's" house. There were 8 women there, and everyone was from a different country, making for some great conversation. The hostess was Canadian, and there were others there from Ireland, London, Congo, Italy, and India. Surprisingly, I was the only American, which I thought was interesting given that this was a Thanksgiving dinner, but I happily recounted my family traditions and recipes. People are always intrigued by the use of marshmallows in our meal, and one commented that everything in the meal is sweet, and she's kind of right. Not everyone was ready to jump into the "what are you grateful for" section, but the overall feeling was that we're grateful for being in Paris and being able to go to meals like this and meet open, like minded people, or at least that's what I continue to be grateful for. We were all instructed to bring our own jar/glass for drinking. When Shelley started these events a few years ago, she didn't have enough glassware, so she asked people to bring their own, and now it's just a nice tradition. A Frenchman once misunderstood and translated it to bringing his own vase, but being a good sport, he drank out of the vase all night. Luckily mine was more petite and was filled throughout the night with Proseco, red and white wine, with a finale of a nice apple liqueur. Shelley made lovely fresh baked cheese crackers that you could top with her homemade tequila red pepper jelly. She also has a side business where you can buy some of these baked treats and breads. I could see eating a few hundred of those cheese crackers at one sitting. A sweet potato chipotle soup followed, and I was so happy to taste some old spices that I've been missing. The Parisian palate isn't tuned to spicy foods, so most food here is fairly bland, so I welcomed the addition of jalapeno in the silky, smoky soup. Next came a perfectly cooked chicken (ok, not turkey, but this had even more flavor) with stuffing, sauteed carrots with wine, mashed potatoes and even cranberry. It had many of the flavors from home, including the final one of pumpkin pie. The American had to have the biggest piece which I licked clean, with the lighter, sweeter Chantilly cream on top. This meal and week wasn't the same people and ingredients of home that I'm used to at this time of year, but it was a new taste of many things with a growing family of friends who are also enjoying taking in a different city and learning all there is from each other and this place.